You know that teriyaki chicken that you get at the food court at the mall? The one that smells delicious. The one that the chicken is super tender. 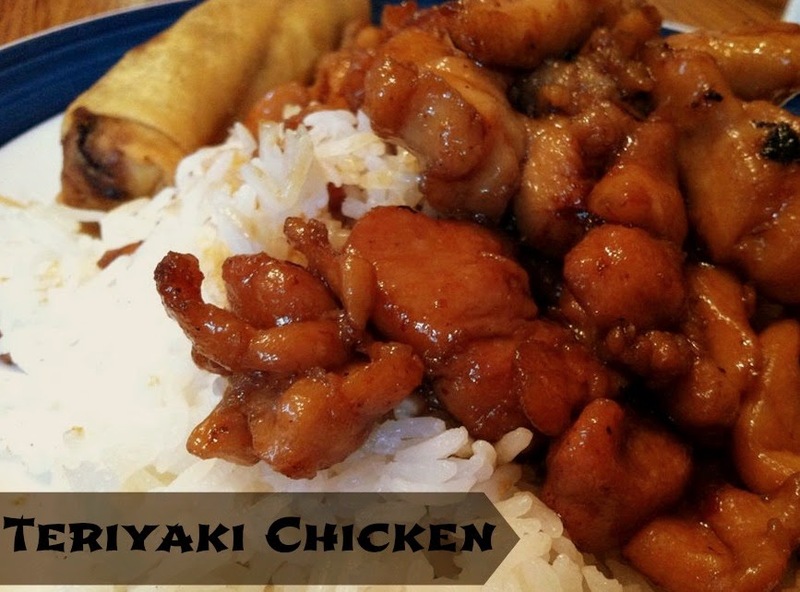 The one that is pretty much the best teriyaki. Ever. Well I have been wanting to recreate that meal for us to enjoy at home. After researching teriyaki chicken recipes and reading tons of different methods on the proper preparation of the chicken...this is what I came up with. Yes, that is an egg roll on my plate as well. We went all out this week :) You can get that recipe here. So, as I said before, I did research this recipe. A lot. It took some time for preparation, but not as much as one might think. Many recipes call only to marinade the chicken for 20 minutes to an hour or so, but I wanted to make sure the flavor really soaked into that chicken to make it flavorful. 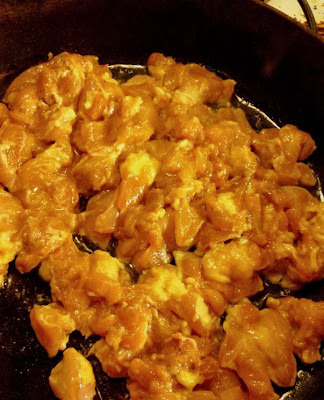 I also did something that I haven't ever done before - I mixed the marinated chicken in my stand mixer with the dough hook before cooking it. Mixing it for about a half an hour really tenderized the chicken. It breaks down all those fibers in the chicken and helps separate the fat from the meat, which for teriyaki is much needed. The result was a tender chicken, that the pieces fell apart naturally (all thighs) and had an awesome flavor. Mirin isn't like rice wine vinegar, so don't substitute it with that. Mirin is a fermented sauce, and when you cook it down for the sauce, sediments do appear, so don't freak out! It's all good! I let it cook almost thoroughly, then I flipped it over, using a spatula. Then I spooned on the teriyaki sauce I had simmering on the stove top. I left it on high heat and let the sauce reduce down and it turns into a glaze over the chicken. Don't add cornstarch - you don't want it to thicken into a sauce, you want a beautiful glaze. Cut the chicken thighs, fat included, into 1-2 inch pieces. Place the chicken pieces into a large bowl. Whisk everything together for the marinade and pour over the chicken. Using your hands (I wear disposable gloves) massage the marinade into the chicken. Press the chicken pieces in your hands to start breaking the fibers down. Coat all the pieces well. Cover the bowl with foil or cling wrap and place in the refrigerator for at least 6 hours. In a stand mixer with the dough hook attachment (or hand mixer on lowest setting) mix the chicken for 20 minutes or so. 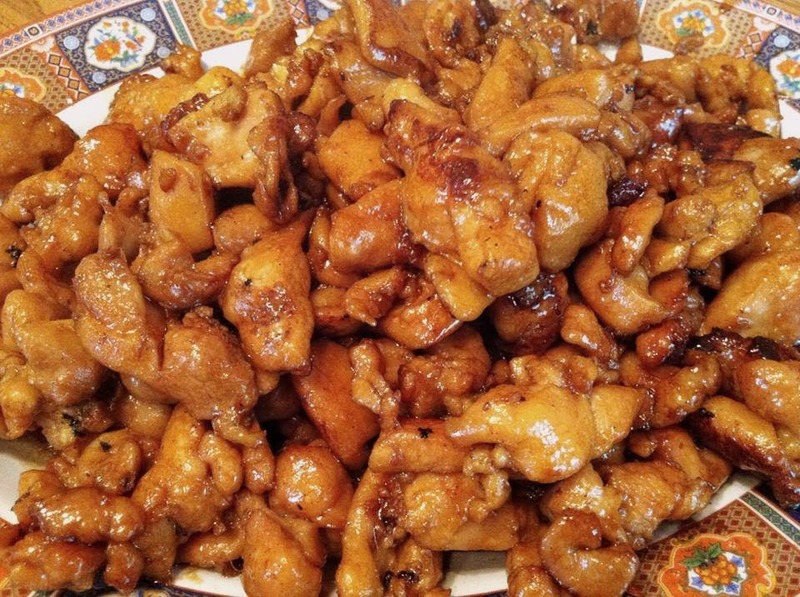 If using a hand mixer, mix the chicken until the fat is separating from the meat of the chicken. In a small saucepan, bring the Mirin to a boil. Let boil for 5 minutes, then whisk in the remaining ingredients. Bring to a boil for a minute or two, then reduce to a simmer until ready to use. Cover the skillet bottom in a layer of the chicken. Let cook almost thoroughly, then flip with a spatula. Break up any larger pieces with the edge of the spatula. Spoon the teriyaki sauce over the chicken - do not reduce the heat. Cook for about two minutes, the sauce will start to reduce. Flip the chicken until it is fully coated in the teriyaki sauce. Let cook another minute, then remove to a serving platter. I had to cook the chicken in two batches. Serve with white rice and spoon additional sauce over the chicken, if desired.